Some of our most treasured memories begin with a simple association: the smiling face of that special someone, tied forever to the place where you first met. Sadly, these episodic memories — memories that encode life events — are often eroded in neurological disorders such as Alzheimer’s disease or traumatic brain injury. Without tapping into the basic neural code that underlies these associations, scientists are limited in how they can help people suffering from memory loss. However, thanks to a new study published in the July issue of Neuron, we are a step closer to understanding how our brains place people into context. The answer lies in a handful of single neurons in the medial temporal lobe (MTL), which rapidly change their firing patterns at the exact moment someone learns a new association between person and place. The story begins more than a decade ago, when the study’s senior author, Dr. Itzhak Fried, and his colleagues discovered a peculiar type of neuron while recording the MTL of patients suffering from debilitating epileptic seizures. Such patients have electrodes implanted deep within their brains to help surgeons hunt down the source of seizure activity, and are kept conscious (but painlessly!) during the procedure. Remarkably, these now famous “Jennifer Aniston” neurons only fired when Fried showed the patients photos of the actress — no matter what she was wearing, which direction she faced or her particular hairstyle — but kept stoic to photos of Julia Roberts. The results suggested that certain neurons in the MTL ­fire to encode concepts of people, rather than particular visual features in a photograph. Follow-up studies showed that these neurons also represent abstract concepts of places and objects, but generally have one preferred stimulus — yay Anniston, nay Roberts. Yet how such neurons link discrete concepts together to form associations remains a mystery. So, in this new study, lead author Dr. Matias Ison of the University of Leicester said in an email to Singularity Hub, the researchers created a condition that mimics “meeting someone at a specific place”, which is very common in episodic memories. The team recruited 14 epileptic patients undergoing exploratory surgery, and painstakingly recorded the activity of over 600 single neurons in their MTL as the patients looked at images of faces, including their loved ones and the actor Clint Eastwood, as well as photos of famous landmarks such as the Hollywood sign and the White House. By listening in on the electrical chatter of single neurons, the researchers were able to tease out those that responded to at least one image. 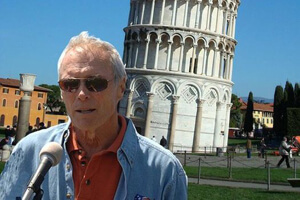 Researchers next digitally superimposed a neuron’s preferred image — say Clint Eastwood — onto a landmark that the neuron had more or less ignored, such as the Hollywood sign, and asked the patients to remember the association. The astonishing fact was that after only a single presentation of a composite image, neurons that previously only responded to one stimulus (Clint Eastwood) almost tripled their firing rate when re-exposed to the combined landmark (Hollywood sign). The finding went both ways, in that a previously landmark-selective neuron also began responding to a paired face. It’s like what happens in real life, says Ison. You only need one encounter to form an association. Using mathematical modeling, Ison and colleagues next tracked down the moment when neurons broadened their tuning — it significantly correlated with the exact moment of learning. This paints “a compelling picture” of how individual neurons — the elements of information processing in the brain — underlie the inception of a new association, says Dr. Howard Eichenbaum, a seminal memory researcher at Boston University who was not involved in the study. But it’s not just about single neurons. This study adds to results from animal research that the mechanism for linking elements of a memory relies on a set of neurons that activate to both elements, explains Eichenbaum. It suggests that partially overlapping neural networks dynamically change to incorporate new memories. Though this study is basic research, it’s also a first step in parsing the neural code that underlies memory inception. It could lead to new ideas about memory capacity and how it deteriorates in patients with dementia, with possible implications in the field of neuroprosthetics, says Ison. For example, artificially activating a concept-linking neuron may trigger a full recall of that memory in humans. The idea isn’t as crazy as it sounds; scientists have already demonstrated its possibility in animals. Fried agrees. Fried is an awardee of the $15 million DARPA fund for his participation in the Restoring Active Memory project that aims to develop software and hardware for implantable neuroprosthetics to help patients suffering from traumatic brain injury restore their loss of memory function. It’s a formidable challenge that tries to bridge basic neuroscience with computing and engineering, and some scientists have publicly expressed their skepticism of its feasibility. Thus far, improvements in hardware outpace that in software. Just a month ago, scientists reported injectable brain implants that can record from and stimulate individual neurons in the rat brain. While still too early to tell, Fried believes that results from this study could pave the road for developing better interfaces to seamlessly sync mechanical implants with the human brain, and one day, help those who suffer from memory impairments.